I am so in love with little play kitchens. Here are a few homemade kitchens that have been pointed out to me in the last few months. So inspirational . . . This kitchen was created from an old entertainment center over at Sutton Grace. How fun is that? Vintage Songbird made this cute little kitchen out of an old night stand. Darling. This sweet kitchen was made from scratch by Crafty Chic Mommy. Endless fun! Knock Off Wood provides the building plans for this fun kitchen. 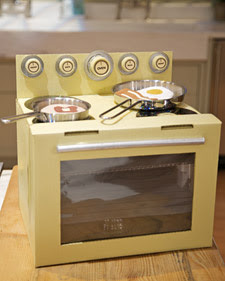 Check out this simple little stove made from a box from good ol' Martha. How can you not love these? Isn't all this talent great? Have you created a little kitchen of your own? I'd love to see it. I just completed one for my daughter's 2nd birthday! It turned out cuter than I had anticipated... check it out. There are some impressive play kitchens out there that provided great inspiration for making one for my son's 2nd birthday, which is today!